Hailing from BC, Canada GALACTIC PEGASUS started out as the solo project of Andrew Baena in 2011. Since then the band has built a built a loyal following via Youtube videos such as the tongue-in-cheek ‘How To Get Signed To Rise Records’ (viewed an impressive 430,000 times and counting! ), covers of mainstream artists like SKRILLEX, and original tracks. NZRock: GALACTIC PEGASUS started life as a one man band but now there are 6 of you. With the new music you’re working on is it a collaborative effort or is there still one person coming up everything? Baena: With the new material, we are trying to make it a lot more of a collaborative effort. The EP was half written entirely by me, before the band came together, so it’s definitely going to sound a bit different next time around. I think that our track ‘Smashing’ is the most like what the newer material has been sounding like. NZRock: How did the current line-up come together? Baena: The current line-up has been in the making over the past 4 months. After we played our first live show, I knew that I wanted to take the project farther and become a full band. So I began talking with other people in the scene who I thought were talented, and who displayed interest in the project. Nigel was the first member to officially join. Roosie (Andrew) had been filling in on bass for our few live shows, and he also decided to stick around as a permanent member. Same thing for Dallas, he was the fill in drummer for a few shows and we decided to ask him to join. Trevor was friends with Roosie and Nigel, and they introduced me to him. We played around with the idea of having two vocalists and we eventually decided that we liked the idea, and added him to the line up just before recording vocals for the EP. Cooper is actually in Dallas’ other band, and he filled in for a couple of shows, so we asked him to join as well. That was a cool idea releasing the instrumental version of your Mirages EP. It’s a totally different experience without vocals. What was your reason for doing it? Baena: I’ve always had an appreciation for bands who released instrumental versions of their albums, such as PERIPHERY, TESSERACT, etc. So it felt only natural to do the same. I also thought that by releasing it instrumentally, people would be more inclined to do vocal covers, which would help spread our music even more. ‘.EXE’ has to be one of the catchiest intros I’ve heard in a long time. How are you going to out-do those bass drops when it comes to the new album? Baena: Haha, I’m not sure! That song, well, the whole EP has a pretty ridiculous amount of bass-drops. ‘.EXE’ was written as a way to test glitch sounding drums and guitars actually, and it came out great. We haven’t really made any new ‘intro’ songs or ideas like that yet, but we’re always looking to out-do ourselves! How far into recording your debut album are you and what’s the new material sounding like compared to your EP? Does the new album have a title yet and how long until we get to hear any of the new songs? Baena: We don’t have a title for the new album yet. We’re also not sure how long till we release something new, since our EP is barely 2 months old. We’ll probably start playing the new stuff at live shows as we complete them, but we’ll see. Chris Thomas from Vision Studios mixed and mastered your EP. Will you be working with him again on the new album? Baena: We were all very happy with the work he did with us for our debut. He is the one that taught me most of what I know about mixing so it made sense to go with him. As for working with him on future releases, I’d love to! You’ve done some interesting covers from music outside the metal genre like SKRILLEX and KATY PERRY… you’ve even done the Power Rangers theme song… and gone gangnam style. What made you pick that music in particular and what else are you planning on djentifying in the near future? Baena: If you have ever heard of ‘Clocks,’ he was the one that started doing the katy perry djent covers. I was always fascinated by his work and I wanted to do something similar, and it ended up being something that I had a lot of fun doing! Also, working with For Salvation helped a lot too, since he is into that kind of stuff haha. We usually pick songs that are popular at the time, and we know will generate a lot of views, but are also fun to play with. As for the future, we have another Ellie Goulding song in the works at the moment! Those covers have done really well on Youtube. 94,000 for the gangnam style vid and over 200,000 for ‘Cinema’ originally by SKRILLEX. 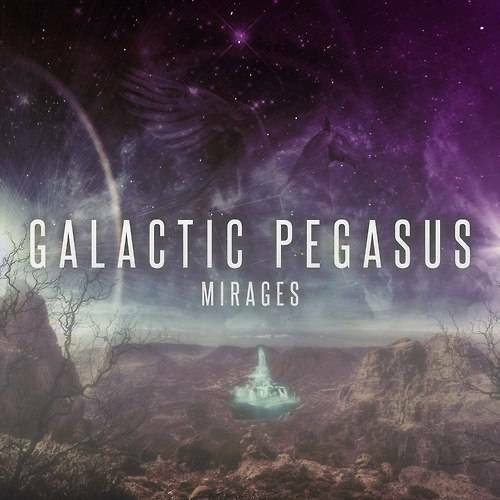 Not taking away from your awesome work on the Mirages EP but do you think those covers have done a lot to boost the profile of GALACTIC PEGASUS as well? Baena: I definitely think that they helped get the Galactic Pegasus name out there. I think a lot of our fan-base comes from those videos, and we hope that they stick around and check out and dig our original material as well. How’d you get onto working with For Salvation on your cover songs? Baena: He actually posted on my wall about a year ago asking to use one of my instrumental covers, along with a link to a sample of his vocals. I was really impressed and asked him if he wanted to work on a cover with me (2012 – The Word Alive). He was interested, and ever since then, he’s been my go-to guy any time I need some clean vocals! He also is very much responsible for picking which pop songs we cover usually. ‘How to get signed to Rise Records’ was just pure genius and I see that you’ve even added it to your live set. Have you heard any feedback from the label about it? Baena: I actually have not had any formal education in recording. Everything that I know how to do, is from asking questions to people that I look up to, or just browsing forums collecting tips from users. Chris Thomas from Depths/Vision Studio played a large part in that. He was/is always willing to give me tips on how to improve my mixes. I record everything in Reaper. My guitar is an Ibanez RG7321 with crunch lab and liquifire pickups, and the bass is an Ibanez SR505BM. Both are recorded using a line 6 POD Studio GX that I use as a DI box to record the signals dry. I then apply all digital amp modelling; guitar pro, ezmix, and CLA guitar. Are you guys planning to tour the band overseas anytime soon? Baena: We have not even had the opportunity to tour locally yet unfortunately. It’s hard to schedule it, since I am in university, and some of our members are still in high school or have full time jobs. We’d love to take the opportunity if it all aligns perfectly though! Will you eventually allow overseas international shipping of your merch? I’m real keen to buy a Galactic Pegasus hoodie! Baena: Yes! We are working on it, just not sure of the cost of shipping at the moment. Once we get that sorted out the store will be updated and I’ll let you know!